From an early age I traveled with my family in Europe and was exposed to great art and architecture. I started drawing and painting at the age of 6, and at the age of 16, my family and I moved to the San Francisco Bay Area. In 1971 I received a Bachelor of Architecture Degree, with a minor in painting, from the University of California, Berkeley. At that time, I also became passionately involved in Spanish Gypsy Flamenco song and dance, and, for the last 40 years I have been a professional Flamenco dancer and singer. My Flamenco career took me on extended visits to Spain, during which I attended the Escuela de Bellas Artes in Seville for 2 years, and studied majolica tile painting at the Academia Triana in Seville. I concurrently developed a career as a designer of kitchens, bathrooms, fountains and patios. Since 1991, I have placed major emphasis on drawing and painting, furthering my studies at Laney and Merritt Colleges, with six semesters of figure drawing with Helmut Schmidt, and painting for four years under the tutelage of renowned painter David Hardy. My artistic influences include Michelangelo, Rubens, Velasquez, Murillo, El Greco, Sorolla, Homer, Maynard Dixon, and Georgia O'Keefe. My main medium is oil paint on canvas, linen or gesso panels and I use a combination of glazing and thicker applications of paint. In my figure painting, I attempt to bring the ideals of the great ages of painting into a contemporary context. 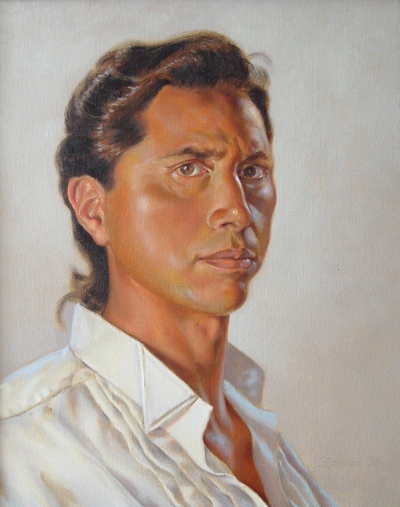 In 1997, I became a finalist in the American Artists' Annual Portraiture Competition for my self-portrait "Flamenco Me". In 1999 I placed 3rd in the Portraiture Competition for my painting "Avery in Pink". In 2000, I placed as a finalist in the National Park Academy of the Arts Competition for my landscape painting "Slumbering Cauldron".